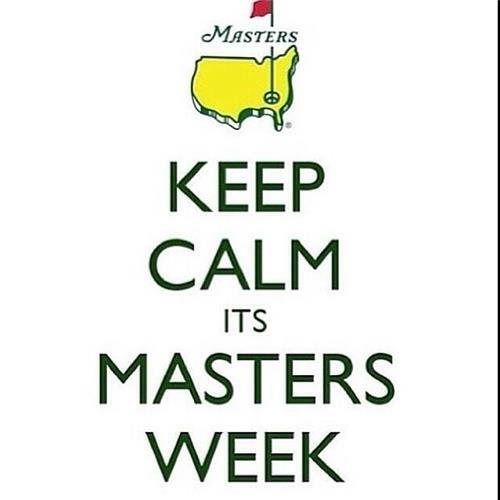 Live updates from Augusta National as Rory McIlroy, Adam Scott and the world's best golfers battle for the first Major of 2014. 'Mr Dependable' Jim Furyk sinks a calm and collected six footer on the second for the birdie and he's three under and heading in the right direction. Spieth and Bubba on the tee at the 1st. The youngster has the 'honour' of going first. Whatever happened to age before beauty? Rose drops a shot on the 3rd which means he's kicked off his round with a bogey, birdie, bogey. It's entertaining but we could do without the dropped shots Justin. Ah, the vagaries of the greens at Augusta. Fowler has a 10-footer for birdie on the 2nd but contrives to three putt for a bogey.I need sunglasses to cope with the sheer iridescence of his orange outfit. Westwood drops one on the 3rd and that famous saying 'The Brits are coming' is ringing a tad hollow at the moment. A touch of redemption for McIlroy. Birdies on 7, 8 and then 9 take him to two under for the day and more respectable one over for the tournament. Kuchar sinks a tiddler on 2nd for the birdie and he joins the leaders on five under. That's more like it, Poulter birdies the 7th to leave him evens for the day and the tournament. Damn it. Westwood three putts on the 4th for a double bogey. 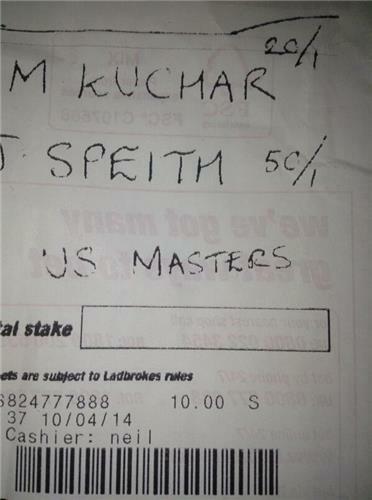 Is it all over for the man who's played in 63 Majors and never won? I think it might be already. Spieth pitching for his third shot, short range over the water. He simply has to get it on the green... and does. Great shot and great chance of escaping with just one dropped shot. Bubba gets his delicate chip over the brow, onto the green and within four foot. He's in the driving seat now. Fair play young man. Spieth gets up and down for a bogey but it could have been a lot, lot worse. Bubba though keeps his considerable cool to sink his par putt and he's two shots clear. Par five 13th and it should favour a big-hitting chap called Watson. Yep, he's hit an absolute monster from the tee. Young Spieth is in the trees! Word up, we have a new contender. Blixt birdies 13 and moves to five under, level with Spieth and two adrift of Watson. Who said two-horse race? Jonas Blixt suddenly T2 at the masters. A @Zurich_Classic commitment. Spieth can get out of the trees but in all depends on the lie. He hacks it out onto the fairway and he's back in business but still behind Bubba's initial drive. Spieth to play first but and he chips to within 10 feet, which doesn't sound that impressive but on these lightning greens, it's a subtle effort. Bubba chips uphill but catches the last of the short rough and isn't on the green yet. 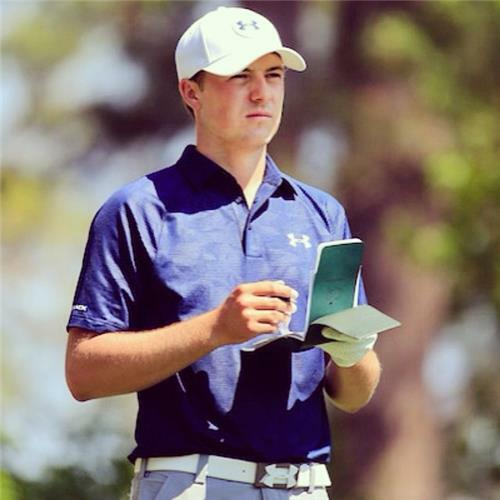 Spieth misses a short one to make birdie. Bubba sinks his par putt and the youngster spurns a golden opportunity to sow some seeds on doubt. Watson is three clear with three to play. Bubba Watson pars No. 15 and has a three-shot lead over Spieth and Blixt with three holes to play @The_Masters . Westwood birdies the last to finish one under. Really solid shot from Watson to leave it 16 feet away from the hole. he's not giving Spieth any opening. The 20-year-old steps up and hits his own approach with an eight iron and the two players are roughly equidistant from the pin. He makes a mess of his second shot and it looks increasingly like a two-horse race. Although I do acknowledge I've said that before. Spieth again can't make birdie...taps in for three but surely that's not enough. Watson makes elegantly sure of his three and it's three up with two to play. It's going to take an unprecedented implosion from Bubba to deny him the Green Jacket now. 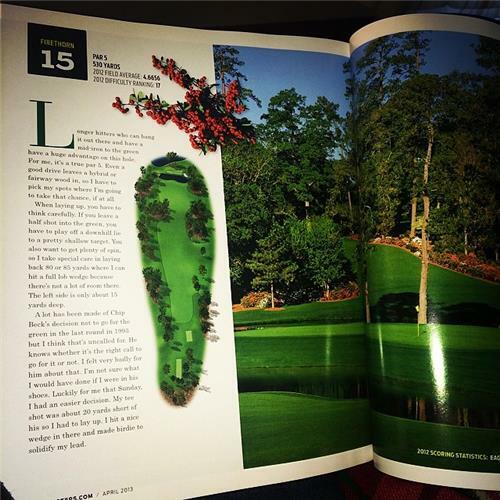 @MikeAndMike @JordanSpieth @bubbawatson @The_Masters speith fell apart! Watson drives off the fairway on 17th. Spieth follows his lead. Who will be happier when they reach their ball? Jimenex and Fowler finish their day's work. The Spaniard is four under and can home safe in the knowledge his 66 on Saturday was the best round of the 2014 Masters. Miguel Jiminez finshes The Masters with a great -4, top Man ! Spieth plays out of the rough on 17 but nearly decapitates a spectator with his effort. Watson plays out from almost the exact same spot and gets it to the edge of the green.